Airtel has recently started campaigning heavily for Airtel 4G claiming to be the fastest network provider for 4G & 3G connections in India. Airtel has promised unlimited life time calls and 3G/ 4G free if any other network providers can break their network speeds. In this post, I’m not going to show any methods to break this challenge but to show how to use this fastest Airtel 4G internet for Free and that too unlimited. Many tricks we had shared in the site for free Airtel 3G is no longer working. Use this latest trick for getting unlimited Airtel 3G for Free. If you have previously used any kind of free airtel 3G tricks, you might be knowing about the procedures involved either be it latest proxy or through VPN. In this post, I will describe all the updated versions of the trick for getting free Airtel 3G connection. Bookmark this page for future updates or follow on Facebook. We are posting only the Airtel 3G tricks which worked for us without reducing main balance. 1. Download Hammer VPN from the link given below of post. Hammer VPN helps to to defeat speed throttling and blocking imposed by Airtel. It also helps to mask your IP address & identity using VPN. 2. Activate trial Facebook or Twitter data packs from Airtel, only if you haven’t done previously. 1. Enter this details & check whether this setting is working for free Airtel 3G. Connect & Check with all this options and select which ever suits your state for getting free 3G internet. Settings for Airtel differs according to state, so you guys will have to find which ever is working for you. Please let me know which setting is working for you in your state, post them as comments. It will be helpful for other too. In case above settings doesn’t work for free 3g internet, try the advance setting option in Hammer VPN and enter below values. Download Hammer VPN for Free Airtel Internet 3G/ 4G access from this link. Small update for this post. I’m sharing a new trick which allows you to Enjoy 250Mb Free 3G on Airtel Using Droid VPN application for android. Install Droid VPN from android store. Go to Settings option in the app and click on Connection Protocol and set it as TCP. Go back to Settings Menu of Droid VPN and select HTTP Headers, & enter below settings. Click Ok and then Hit on the Connect Button and enjoy free airtel 3g internet on your mobile. 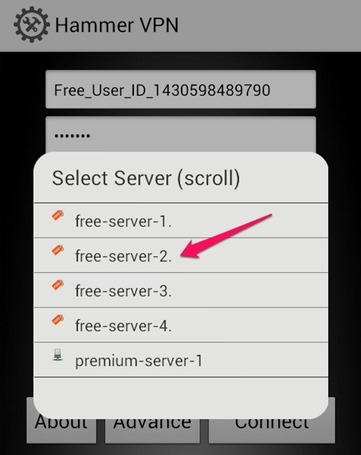 Open the app and Select any free server available. Set settings for free airtel 3g as below. Latest trick for getting free 3g access in Airtel is by using VPN app called Netify (android). Follow the steps mentioned below. Open the Netify VPN app and set settings as follows. In settings, select Remove port. Click on Save & Exit. Connect using Netify app and enjoy free Airtel 3g internet. Have you tried Troid VPN? Which VPN are you using for free airtel 3g? If you’re getting slow airtel internet speed, try changing vpn proxy. hey can i use 2g haannn????! You can use our airtel 2g trick! sir, plz help me in this situation and provide me a new tcp proxy trick. Latest update for accessing unlimited Airtel 3G through Proxy trick. 1. This trick is using proxy service from PD-Proxy. You can register for free with them. 4. Save & go back. now connect PD-proxy using demo server. It will work and give free airtel internet. plz give me valid proxey and port my phone is not connected in old proxy plz help me…. per day 100 mb only. why ??? Thanks for new VPN. It’s working and no balance deducted. How to increase speed for torrents? Iam having microsoft Lumia 640xl operated by windows os ..i need to know how I use this vpn service in my windows…. M from Karnataka, m using this hammerVPN from 2 days, but it has limited data per day, I have seen that airtel users can use unlimited 3g internet, I have a airtel sim, plzzzz help me to use unlimited 3g without having premium. am confusing of using lport,rport, and current network. mera setting nehi ho raha hai plz plz sir kuch karo muje free airtel net chahiyee…..